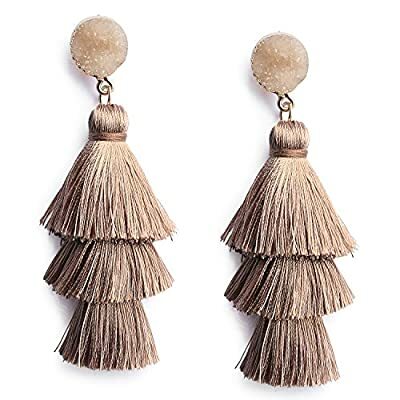 These fashion tassel earrings features super fine soft 3-layered thread tassel with great gloss and the top consist of natural druzy stone which make it much better looking compare with other tassel earrings. Elegant bohemian style, super fun and right on trend, make you the focus of all the crowded. This design inspired by the element of the current trend tassels and the inspiration of natural healing stones, the design makes it much elegant. - We are a quite experience team with advanced design concept, professional production factory, first-class level of service. Our goal is creating unique, stylish, beautiful jewelry only for you. - We support our Artisans by ensuring they work under certified humane conditions, are paid a fair wage and produce based on their cultural traditions and natural resources. - We provide environmental, social and economic benefits while protecting the environment upon first extraction of our raw materials until final disposal.